Giveaway is OPEN TO ALL LEGAL U.S. RESIDENTS WHO ARE A MILITARY SERVICE MEMBER, DEPENDENT, DEPARTMENT OF DEFENSE EMPLOYEE, AND/OR AUTHORIZED PATRON OF MILITARY EXCHANGES AND COMMISSARIES IN THE USA AND ON US MILITARY BASES OVERSEAS. NO PURCHASE NECESSARY. The 2019 DECA-Military “Family Food & Fun” Giveaway begins at 12:01 a.m. (Eastern Time ["ET"]) on April 7, 2019 and ends at 11:59 p.m. ET on April 21, 2019 (“Giveaway Period”). Entries for the Grand Prize will be accepted via Electronic Entries to www.mymilitarysavings.com. 1. 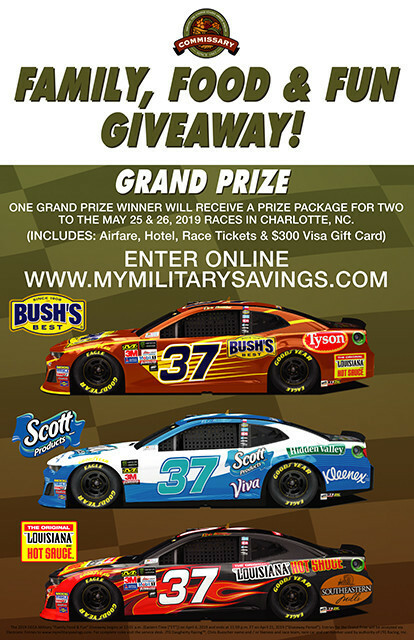 How to Enter for the Grand Prize: You may enter by going to www.mymilitarysavings.com “Limit of One (1) entry per person by any methods or combination of methods of entry during the Promotion Period”. Entries must be received by April 21, 2019. No mechanically reproduced, forged or altered entries are permitted. There will be no verification of receipt of entries. All entries submitted become the sole property of the Giveaway Entities and will not be returned. 2. Eligibility: To enter, you must be a legal U.S. MILITARY SERVICE MEMBER, DEPENDENT, DEPARTMENT OF DEFENSE EMPLOYEE, AND/OR AUTHORIZED PATRON OF MILITARY EXCHANGES AND COMMISSARIES IN THE USA AND ON US MILITARY BASES OVERSEAS and be 18 years of age or older as of April 7, 2019. Employees or agents of Kimberly-Clark Global Sales, LLC, Southeastern Mills, U.S. Military Commissaries or Exchanges, Clorox, Bush’s Beans, and Brand Activation Maximizer, their respective parent companies, subsidiaries, affiliates, advertising, promotion agencies and the directors, officers, employees or agencies, and any of their respective partners or prize suppliers, their affiliated companies, parents, subsidiaries and advertising and promotion agencies, (collectively, "Giveaway Entities"), and their immediate families (defined as spouse, mother, father, in-laws, grandmother, grandfather, brother, sister, children and grandchildren) and members of their households, are ineligible to participate in this race trip Giveaway. 3. Drawing and Notification: One (1) Grand Prize winner will be selected in a random drawing by an independent judging organization, on or about April 27, 2019 from among all eligible entries received by Brand Activation Maximizer (Giveaway) Administrator"). The Administrator’s decisions are final and binding in all respects. Odds of being selected as a winner depend on the number of eligible entries received. The potential winner will be notified by phone or mail and must respond to the notification within seven (7) business days of the notification attempt or the potential winner will be disqualified and alternate winners will be selected. One (1) Prize awarded per individual, household or family. 4. Grand Prize: One (1) Grand Prize Winner: One Grand Prize winner will receive a prize package for two to the May 25 & 26, 2019 races in Charlotte, NC. The Grand Prize includes: Two (2) round-trip coach class air transportation tickets (within the 50 states of the USA) from a major airport closest to the winner’s home to Charlotte, NC; three (3) nights hotel accommodations at a Sponsor specified hotel, based on double occupancy; two (2) Cup tickets, two (2) Xfinity Series tickets and a $500.00 Visa Gift Card for meals and incidentals. Additional transportation not included. The Approximate Retail Value (ARV) of the Grand Prize is $3,000. All other expenses and costs, not expressly listed above, including, but not limited to, taxes, meals, tips, transportation and entertainment are winner’s sole responsibility. No transfer, substitution, or cash equivalent for prize allowed. The Giveaway Entities reserve the right to substitute prize (or portion of the prize) with one of equal or greater value if the prize cannot be awarded as described for any reason. 5. Prize Conditions: The potential Grand Prize winner will be required to execute an Affidavit of Eligibility, a Liability Release and, where legal, a Publicity Release ("Affidavit/Release). Such documents must be signed and returned by the date and/or time indicated within such documents. If potential winner fails to sign and return such documents within that time, or if an entrant is found to be ineligible, or if he/she does not comply with the Official Rules, then the potential winner will be disqualified and an alternate winner will be selected, time permitting. If prize notification is returned as undeliverable, this will result in disqualification and an alternate winner will be selected. In the event either race is cancelled or postponed for reasons beyond Entities’ control, a prize, or that portion of the prize deemed unusable (ie. Race tickets) of equal or greater value will be provided by Sponsor. All federal, state or other tax liabilities (including income taxes) arising from this Giveaway will be the sole responsibility of each winner. Prize package must be used on dates specified or prize will be forfeited. Certain restrictions may apply. Grand Prize winner and travel companion must travel together on the same itinerary, including the same departure date, destination date, destination and return date, and must have valid travel documents (i.e. valid photo I.D.) prior to departure. Travel companion of the Grand Prize winner will be required to execute a Release of Liability prior to use of prize. All portions of the prize must be used on dates specified or prize will be forfeited. Flight schedules are subject to change without notice. Once travel commences, no stopovers are permitted; if stopover occurs, full fare will be charged from stopover point for the remaining segments, including return, of the trip. The Giveaway Entities are not liable for any expenses incurred as a consequence of flight cancellation/delay. The seat selection and timing of trip is subject to availability and confirmation of reservations. Trip may not be combined with any other offer and travel may not qualify for frequent flyer miles. Except where prohibited by law, the winner’s entry and acceptance of the prize constitutes permission for the Entities to use said winners’ name, photograph, likeness, statement, biographical information, voice, and city and state address on a worldwide basis, and in all forms of media, in perpetuity, without further compensation. 6. Giveaway Conditions: This program is subject to all applicable federal, state and local laws. By participating, entrants agree to be bound by these Official Rules and the decisions of the Giveaway Entities and Administrator and waive any right to claim ambiguity in the Giveaway or these Official Rules. The winner and entrants also agree to release, discharge, indemnify and hold harmless the Entities and each of their respective officers, directors, employees, representatives and agents from and against any claims, damages or liability due to any injuries, damages or losses to any person (including death) or property of any kind resulting in whole or in part, directly or indirectly, from acceptance, possession, misuse or use of prize or participation in any Giveaway related activity or participation in this Sweepstakes. 7. Limitations of Liability: The Giveaway Entities do not assume any responsibility for incorrect or inaccurate capture of entry information, including, but not limited to, technical malfunctions, human or technical error, printing errors, lost / delayed / garbled data or transmission, omission, interruption, deletion, defect or failures of any telephone or computer line or network, computer equipment, software or any combination thereof. The Entities are not responsible for lost, late, damaged, delayed, destroyed, misdirected, incomplete, illegible, postage-due or mutilated entries. Giveaway Entities may prohibit an entrant from participating in the program or winning a prize if, in its sole discretion, it determines that said entrant is attempting to undermine the legitimate operation of the by cheating, deception or other unfair playing practices or intending to annoy, abuse, threaten or harass any other entrants or Entities’ representatives. The winners agree to release, hold harmless, and forever discharge the Entities from any and all claims, demands, losses and liabilities, of any nature whatsoever, which he or she may now or hereafter assert, including but not limited to, claims for injury, death or illness arising out of or claimed to be arising out of entry, prize acceptance or use/misuse of the aforesaid prize. 8. Winner: For the name of the winner, which will be available after May 30, 2019, send a self-addressed, stamped envelope with a written request, to: The “Family Food & Fun” Giveaway Winner, c/o Brand Activation Maximizer, LLC, 7201 Caldwell Rd, Harrisburg, NC. 28075 by June 30, 2019. 9. Sponsors / Entities: The Sponsors for this Giveaway are Brand Activation Maximizer, 7201 Caldwell Rd, Harrisburg, NC. 28075. The Entities for this Giveaway are Bush Brothers and Co., 1016 East Weisgarber Rd., Knoxville, TN 37909, Kimberly-Clark Global Sales, 2100 Winchester Rd., Neenah, WI. 54957, Southeastern Mills, 333 Old Lindale Rd, Rome. GA. 30161 and Brand Activation Maximizer, 7201 Caldwell Rd, Harrisburg, NC. 28075.